Want to know what Boys & Girls Clubs are all about? Hear from our experts, get behind-the-scenes perspectives and even read about the young people who have been positively impacted by Boys & Girls Clubs. As you know, it’s been a rough couple of weeks for everyone in Houston and surrounding communities. But it's children who are always the most vulnerable in situations like this. That’s why it was critical to get back up and running. Our team worked so hard to stand up Club operations quickly as possible to serve the communities most in need. Five of our locations opened on September 1 (just days after the storm), while all but one of our other locations opened on September 5. Safe and happy Club members and staff in Houston. We knew that at a time when people are trying to rebuild their lives, it was important to give children and families a safe and secure place to go, so we provided full day operations to allow families to get back to work or start their own recovery process while schools remained closed. We’ve also been working at the shelters with pop-up Clubs serving about 100 kids per day. That’s the role we play in our community every day, and it’s amplified during critical times of need like we are experiencing now. At the same time, our staff were impacted by the storm. About 20 people – approximately 15 percent of our total staff – have been able to make it here and help with the kids. It’s a tough time and everyone is dealing with getting their own lives in order… we are working to get our Club team back on their feet as quickly as possible, and our staff is truly selfless. They’ve been working overtime doing whatever needs to be done. Even though they had their own personal devastation to deal with, they were here - cleaning, removing debris, serving meals. Just a selfless group of people who’ve put aside their own losses to give the kids of Houston some respite from the chaos of the past two weeks. I am so grateful for every one of them. They’ve truly risen to the occasion to meet the needs of the kids. It has meant the world to our team to have support from around the Movement. Clubs across the country have been sending financial donations and supplies. A busload of smiling faces from our friends at Boys & Girls Clubs of America helped lift our spirits and helped recovery efforts, while Kathy Holland, Director of Operations at the Boys & Girls Club of Kenosha drove 17 hours from Wisconsin to bring supplies, hugs and donations. It’s incredibly rewarding to see these signs of hope in what is definitely a widespread, catastrophic event. 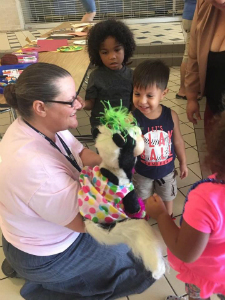 Helping little ones stay happily occupied post-Harvey. We’re grateful for what Boys & Girls Clubs of America and Clubs from across our Movement are doing for us. The immediate relief is starting to dissipate and leave. But we’re here, doing exactly what our mission is intended to do. And we are going to be here for the long term, serving all the kids who need us today and every day. Southeast Texas continues to assess the massive destruction caused by Hurricane Harvey and its unprecedented rainfall and floods. 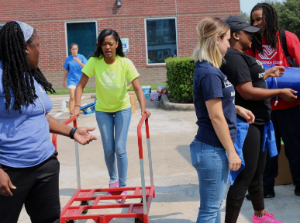 That includes at least three Houston-area Boys & Girls Clubs that suffered major structural harm:roofs blown off, severe wind and water damage, basic equipment and supplies lost. Volunteers from Atlanta hard at work. 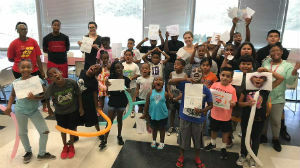 But somehow, in the midst of terrifying and historic floods, the Boys & Girls Clubs of Greater Houston continues to serve its community, even extending hours at the five Clubhouses its managed to re-open. At Boys & Girls Clubs of America, we’re working with our Board of Governors, leveraging our partnerships, and calling on the public to make a donation and help affected Clubs continue to serve the kids of their communities. 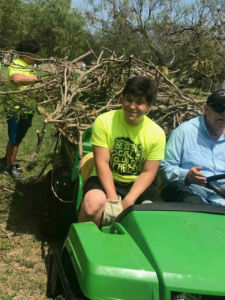 Clearing brush and fallen tree limbs was just one of many tasks Club kids and volunteers tackled together. Clubs and kids are stepping up, too. From bake sales and raffles to supply drives, Club members around the country are demonstrating values that we work so hard to instill, such as leadership and civic duty, to help all hurricane victims. On Monday, I plan to travel to Houston to meet with local Club leaders, see what we're dealing with, and help however I can. BGCA will continue to monitor Hurricane Irma, and keep close contact and provide counsel to Clubs that could be in its path. Those wanting to make a donation to help affected Clubs can visit BGCA.org/DisasterRelief. All donations will go directly to impacted Boys & Girls Clubs.